Peterborough fans will have one stand less now as the east side goes under construction. United want to start works immediately, having now reached an agreement with the city council. 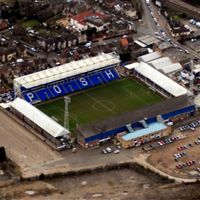 Officials at Peterborough United and Peterborough City Council have formally signed the documentation regarding the redevelopment of the London Road Stadium. Chief Executive Bob Symns said: "As everyone is aware we have been talking to the council on a regular basis and are delighted to confirm that all documentation has been signed and that it is all systems go on the redevelopment of the Moy's End section of the stadium. “All systems go” for the stand’s revamp means “all systems down” for the stand itself. Disconnecting all systems serving the east end of London Road Stadium is the first task awaiting Kier Eastern, the contractor. Work is to begin immediately, but the east end isn’t all United are planning to change. Richard Hodgson, Head of Strategic Projects for Peterborough City Council, said: "As planned we expect to fully start work on the new Moy's End stand and skills centre next month. In addition, we are currently in the final stages of preparing a planning application for the retrofit of the London Road stand (west). "Since Council agreed in July to allocate the additional £1 million for the retrofitting of London Road we have been progressing a series of decisions which will enable works to commence on site for the new Moy's End and skills centre. For example, this has included amendments to the existing leases with the football club which will allow us access to the site to begin demolition and construction, and the letting of the contract for construction.